First off, here’s a snapshot of how bitcoin and its buddies have fared in the past seven days as of June 8, 3:00 am GMT. 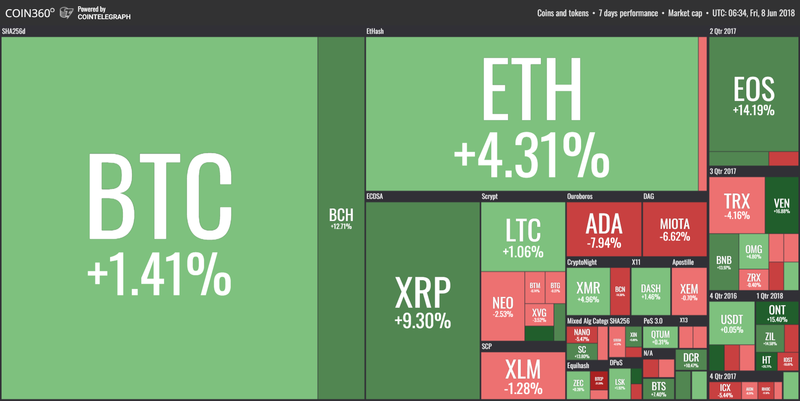 Finally some green! Following last week’s big moves, Coinbase continued to step up its game with more developments this week. The latest of these include the acquisition of securities dealer Keystone Capital Corp, Venovate Marketplace, Inc., and Digital Wealth LLC. Prior to this, Coinbase also shared plans to tap into the Japanese market. It plans on applying for a license under Japan’s Financial Services Agency within the year. No SEC regulation for bitcoin? Fears of strict regulation on cryptocurrencies by the SEC were abated when Chairperson Jay Clayton cited that bitcoin is not a security since it acts a replacement to sovereign currencies. As such, many interpreted this to mean that bitcoin would not be subject to SEC jurisdiction. However, SEC Director of Division of Trading and Markets clarified that exchanges that offer ICOs are still subject to regulatory compliance. He added that the agency is underwhelmed by the adherence of several exchanges to these rules and that they’d probably see more registrations soon. The SEC also created a new senior advisory position to oversee securities regulation of the cryptocurrency industry, appointing Valerie Szczepanik as Senior Advisor for Digital Assets, as well as Associate Director of the Division of Corporation Finance. Now that’s a name we’ll likely be hearing more often from now on! One of the factors seen to be keeping bitcoin afloat recently is the ongoing crisis in Venezuela, as the sliding value of their local currency led citizens to pursue other means of financing and investment. As reported by Criptonoticias, the volume of Venezuelan bolivar to bitcoin increased by 138% from March to April, and by 39% from April to May. So far this month, volume is up by roughly 40% already.